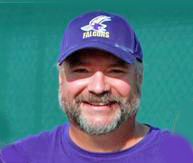 Welcome to Coach Parker’s Coaching Youth Football Tips, Talk and Plays. In 1994, I began volunteer coaching youth football before I had my two sons, Bear and Zane. I coached for the Plano Sports Authority and was the Assistant Head Coach / Offensive Coordinator for the Hurricanes 7, 8, and 9 year old team. We went 5-3 and did very well in the play-offs and our coaching peers voted our staff the PSA Coaching Staff of the Year in 1994. In 1995, I moved to Denver with my wife and did not coach youth sports again until I started coaching my oldest son’s Tee Ball team in 2001. In 2004, I started coaching youth football again when I started coaching Bear’s YMCA flag football team; the Colts. We went 5-3 our first season, and I learned a lot about flag football. Our second season was an amazing season as the Bulldogs. We picked up a 7 year old John Elway like quarterback and went undefeated; 8-0 with 40 TD’s to 0. That’s right no one scored on us too. In 2006, I started coaching my oldest son’s youth tackle football team in Arvada, Colorado just Northwest of Denver near Golden. Bear played for the Arvada Midget Football Association, which is part of the Jefferson County Midget Football Association. I was also a member of the AMFA Coaches Committee. With the three seasons as the Arvada Pirates Head Coach, the Pirates went to the playoffs each year. In July of 2009 my family moved to Keller TX, a growing community about 10 miles North of Fort Worth on your way to Denton, Texas. I was unable to find a volunteer coaching spot prior to that year’s youth football season, but about midway through the football season, I was asked to be the offensive line coach for Keller Hurricanes Junior Select team with the Keller Youth Association in Keller, Texas. My oldest son was playing for the Kanes at the time. That was a rough season for Bear. The Kanes were a new team in a very competitive Select league in Texas. The Kanes’ offensive line improved and they made the playoffs. In the Spring of 2010 I coached my first a Spring Football team; the Jaguars. My youngest son Zane played on the Jaguars as the Single Wing quarterback and linebacker. His Fall football coach put this young “Select Recruit” team together to “try-out” players in the Spring league. Drafting young inexperienced players to try them out in a competitive league is a big mistake, and we learned a big lesson that Spring. Poor Zane was beat up that Spring. We went 4-4. It was a rough season. In the Spring of 2010 I was asked to coach a 6th grade KYA Pro Bowl team made up of the top KYA players from that Spring. We were going to play a TSOF Select team, the Colts, in a KYA Bowl game. I had two weeks to put together an All Star team to play against an actual team that won their consolation bracket Super Bowl. Plus my son played for the Colts. Well, The KYA Pro Bowl team won that Bowl game against the Colts; 12-6. It was bittersweet victory because my son was upset. This game is a highlight in my youth coaching career. In the Fall of 2010 I was the Defensive Coordinator for the Keller Raiders 4th and 6th grade teams in the Texas School of Football Select league. TSOF is a top Select football league in TX. Several teams from the Deion Sanders organization TRUTH play in the TSOF league. Our 4th grade team struggled in TSOF due to lack of speed and size. The 4th grade team was also a young team. The Raiders’ 6th grade team almost went all the way to the Super Bowl but an ex Dallas Cowboy player’s team beat us with a future blue chip quarterback and receiving corp in the second half of the semi finals. In that playoff game, our defense held them to their lowest points scored in a game in their last two undefeated seasons. The Sooners went on to win the TSOF 6th grade Super Bowl. In the Spring of 2011 I was the Assistant Coach / Offensive Coordinator for the KYA Oilers Bantam team which won the KYA A Bracket Bantam Spring Super Bowl 2011. What a great Spring season. We struggled as a 5-3 team all season, and then everything came together in the Spring playoffs and we won it all. Sometimes luck is a great thing. In the Fall of 2011 our team name will be the Falcons. In the Fall of 2011, I was the Asst Coach / Defensive Coordinator for the Falcons. Our defense only allowed 30 points all season including playoffs and Super Bowl.. The Falcons went undefeated and won the 2011 Fall A Bracket KYA Sophomore Super Bowl. In the KYA Spring 2012 league, our Bobcat team lost in the “A” Super Bowl 0-12. Our Fall 2012 Razorback team went undefeated and won the A bracket Super Bowl. In the Spring 2013 our WarHawk team went undefeated in the regular season and after losing a few players to a family move and injury we lost the A bracket Super Bowl. It looks like our Fall 2013 season will be a rebuilding season since many of our players are moving to middle school football. I grew up in Texas living and breathing football. I started playing football in 3rd grade for the Spring Branch YMCA, just Northwest of Houston and continued playing through High School. In High School, I played for one of the best Coaches in Texas High School football history, Ron Schroeder. FYI Coach Schroeder was Drew Brees’ High School Coach. But, I learned how to be a youth football coach from my Pee Wee Coach, John Lewis. Coach Lewis coached the Spring Branch YMCA Dad’s Club Bulldogs, and we were undefeated for many years and played at Rice stadium for the YMCA Houston City Championships in 1973. We won in am upset 40-7. I am a huge Dallas Cowboys football fan. I think Tom Landry’s Cowboys were some of the finest teams that Dallas put on the field. I also follow the Titans, since they are the old Houston Oilers and since I lived outside of Denver for 15 years, I am a Broncos fan. I graduated from Texas A&M, so I hope for divine intervention for the Fightin Texas Aggie football team each season, maybe soon. If you would like to contact me, please leave me a blog post comment or you can email me at steve at coachparker dot org. Hi Coach. I see you got the King Crab. Can you push it on the concrete? How about a gym floor if you wrapped the bars in towels? Love your enthusiasm for.youth football. I too find great pleasure from coaching. Thanks for sharing your knowledge with the rest of us. Wow, 6 years old. I would not worry about QB yet. Just approach the coach about coaching. I would not also combine that with my son plays QB. There is already a lot of stress around “daddy ball” with out adding a QB request. Most coaches will see the QB talent and pick it out. And QB has more to do with remembering the plays than talent at 6 years old. Relax and let it all happen. Any advice or tweaks to using either at that level? If you had experience with other schemes that worked well at that level I am all ears. Any additional advice for a new coach such as myself is much appreciated.